Dr. Christopher Blake, Middle Georgia State University president, has joined the advisory board of the Georgia World War I Centennial Commission, which is tasked with helping to prepare high-profile commemoration events in 2017 and 2018. In coordination with the United States World War I Centennial Commission, the Georgia Commission will develop a program to educate Georgians about the significance of WWI in world history and the roles state citizens played in it. The Georgia Commission consists of six unpaid volunteers appointed by the governor, lieutenant governor and state House of Representatives speaker to direct the effort. The advisory board consists of 17 members. Blake, who is British, holds a keen interest in World War I history. Along with Macon-Bibb officials, he led efforts to create an annual wreath-laying ceremony at the World War I memorial at Coleman Hill and recently wrote a guest column for the Telegraph newspaper about the 100th anniversary of the Battle of the Somme, the costliest battle in British military history. The Georgia Commission and those of other states are part of the U.S. World War I Centennial Commission, created by an Act of Congress in 2013. Members of the 12-member national commission were appointed by the president and leaders of the Senate and House of Representatives, as well as the American Legion, the Veterans of Foreign Wars and the National World War I Museum. All four living former presidents have agreed to serve the commission as honorary chairmen. The commission’s mission is to plan, develop, and execute programs, projects and activities to commemorate the Centennial of World War I. Among other things, it plans to establish a National World War I Memorial in Washington D.C. and bring attention to the thousands of World War I memorials in communities across the country that honor Americans who served in the war. World War I lasted from July 1914 until November 1918, with American involvement taking place in 1917-1918. WWI remains America’s forgotten war, even though more Americans gave their lives during that war than during Korea and Vietnam combined, and even though it profoundly shaped the rest of “the American century.” The national commission will use the centennial as a timely and essential opportunity to educate the country’s citizens about the causes, courses and consequences of the war and to honor the heroism and sacrifice of those Americans who served. 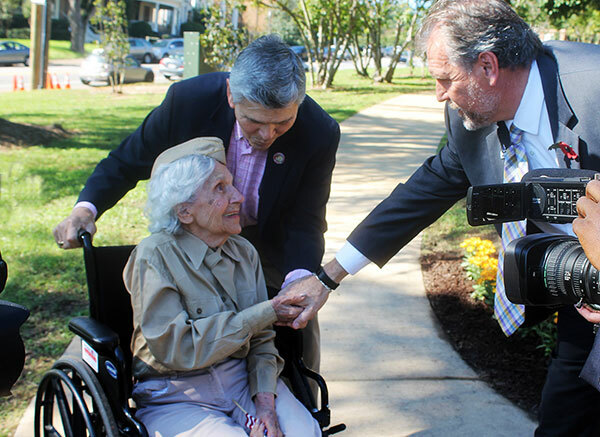 Photo: Dr. Christopher Blake greets a veteran who attended the 2015 wreath-laying ceremony at the World War I memorial at Coleman Hill in Macon.